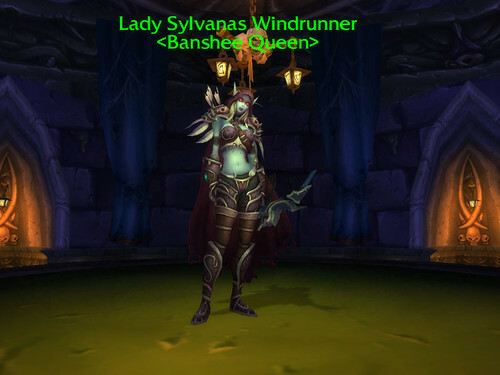 I know, I should be laying down.. but this was too exciting not to post… Lady Sylvanas (FYI, that link has a few spoilers regarding a new event in the game) has received her long awaited model change from Night Elf to High Elf!!! I’ve always been one of those that was disappointed to see the Banshee Queen jiggling about as a Night Elf so I was pretty psyched when I heard she had changed in the Beta so I had to go grab a few shots.. she’s one of my favorite lore characters. 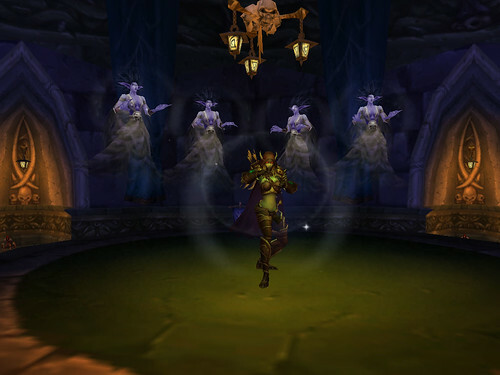 I also checked to see if she’d still perform the “Lament of the Highborne” in the new model and she does! I’m so glad they left that in there, that’s one of my favorite game moments. Anyways, back to the couch for me! This entry was posted in Pictures and tagged Lady Sylvanas, WoTLK, WoW. Bookmark the permalink. Wow! She looks even better than I thought she would after seeing the original concept of her updated look.